To motivate students in learning through quality instruction and collaborative communication, Sharing individual skills, passions, differences and lives through the services and programs that are being provided in Student Development Program. Creating a living, learning, and working environment that encourages the students and staffs to reach their potential and discover their unique purpose. To build relationships among faculties from various disciplines, alumni, and the community that provides the foundation for advancing the knowledge of the profession. To meet the ever changing needs of the student and staffs community, by continually assessing and improving the programs and services to be conducted, and to cultivate partnerships, both inside and outside the college community. Jeppiaar Engineering College has developed and evolved STUDENT DEVELOPMENT CELL (SDC) with the objective of bridging the gap between the academia and the corporate world. SDC is a group of ignited minds clustered together to provide regular inputs for the complete development of a student by making him / her to get prepared to face all the challenges laid down by the competition in the Corporate Industry. The critical skills are identified from the current global job market especially in ongoing Dynamic era of Technology that is needed to reach the peak. Jeppiaar Engineering College realizes and understands that a quality budding technocrat can envision the growth and development of the nation. Therefore, the inculcation of competitive skills among the students, and to develop their knowledge of understanding values and skills is required to produce quality Managers for the future. To further facilitate the Industry- Institute Interaction, we has signed more than 33 MoU’s with reputed National and Multi-National Companies such as CII, Yokogawa, HCL, NSE, BSNL, MSME, Transend, SEED and step-The Hindu. 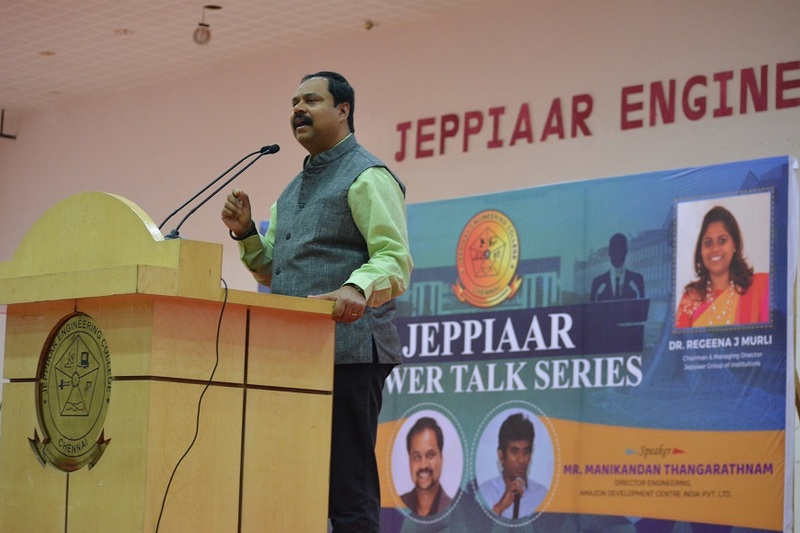 With the Constant support from Our Managing Director and the management, SDC has been motivating students by conducting Talk series under the generalized Umbrella called JEPPIAAR POWER TALK SERIES. Eminent Personalities from Research, Psychology, Philosophy, Social Work, Medicine and Human Resource department were invited to share their knowledge. We encourage Rank Holders and Top Scorers of University Examinations on Achiever’s Day. To build relationships among faculties, SDC has been organizing FDP Programs in all Disciplines. Women Empowerment is the need of the day, We at SDC acknowledges this. We thank and honor all the Women in our campus on WOMEN’S DAY CELEBRATION.